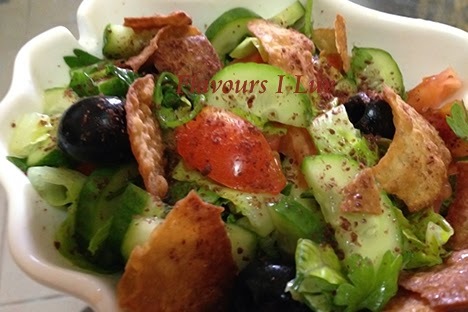 Fattoush is one of the known traditional salads in the middle eastern cuisine. The main ingredient of this salad is "Sumac" which gives fattoush its sour taste. Another special ingredient of this salad is crispy toasted flat bread which soaks up the dressing beautifully. It's a simple recipe, packed with freshness and flavor. The sharp flavor of the sumac, the crunchiness of the chunky cuts of tomato, cucumber and the thin baked pieces of bread to soak up the dressing, make it the favourite salad of middle east. Prepare dressing by mixing all dressing ingredients together in a jar. 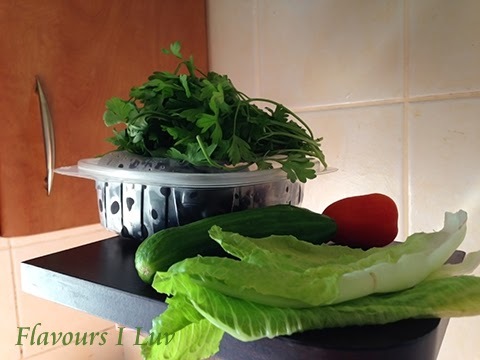 Shake well and keep in fridge while preparing the salad. Place the bread pieces in an oven tray and drizzle thoroughly with some extra virgin olive oil and place in a preheated oven for about 5-10 minutes till golden and crunchy, or you can deep fry the bread instead. Mix all salad ingredients ( except pita bread and sumac ) together. Mix with half of the toasted bread pieces. Add dressing and mix well. Top the salad with rest of the bread and sprinkle some sumac and serve. I completely have no idea about middle east cuisine and the taste! And I think Its difficult to try out in India as there are few things which we cant locate here! Over all im assuming this should be a very yummy and healthy salad :) Thanks for sharing!! Since long before it was in my to do list. You made it absolutely perfect. Healthy and yummy bread salad.